The overall size of this piece is 12" x 18". Pencil on heavy-weight illustration board. Description: This "pencil" piece is "The Three Ubertis." Uberti is a gun manufacturer based in Italy. 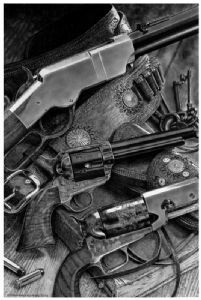 They specialize in the making of fine "Western Vintage Firearms," and are favorites of many collectors and shooters.